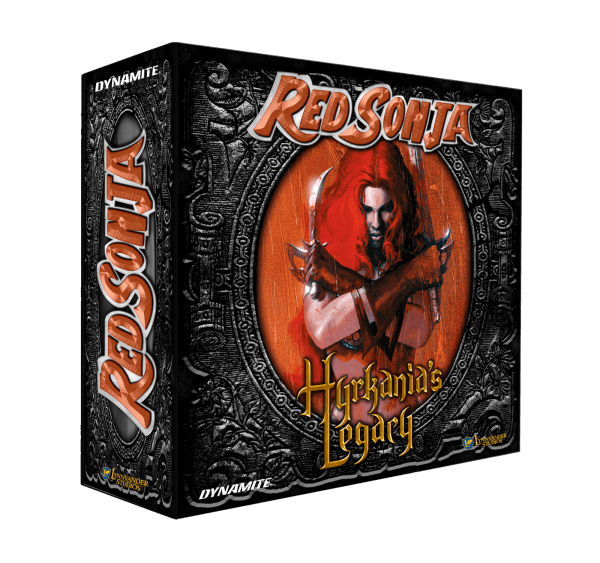 The game maker Legacy has joined with Dynamite to create a Red Sonja themed board game that includes a variety of characters and quests from the comic series. The Kickstarter also includes as possible addition a Red Sonja bust and Simone's Red Sonja: Queen of Plagues depending on which package you choose to back. One exciting thing about this game is how it could even be expanded to include more characters and quests. I would also like to see if anyone makes minis for the game. I have not seen what the 4 initial quests are that are included in the game, but I have always liked the idea of being able to read a story as a book or comic and then play through it. This game should allow for that and that is really cool. The game is 1-4 players cooperative play game with a dice/card combat system. The adventures take place on modular tiles similar to Mage Knight. The board begins with a single tile a large 3d castle tile and the adventure spans out from there. The 3d castle looks like it was very much inspired by Hyrkania. Additionally, the game designers are including metal Hyrkanian coins. One other thing I saw that I immediatly liked (this might sound a little lame) but I dug the box art. Red Sonja is female Barbarian character that initially appeared in Marvel comics Conan Barbarian Comics in 1973. She is known for being a quentistial fiery barbarian hero who is as deadly with a blade as she is beautiful. Both Red Sonja and Conan share the Hyborian sword and sorcery fantasy world. While Red Sonja's iconic chain mail bikini has been critisized in the past as being sexist, the character has overcome this by becoming one of the most popular characters for both female creators and also female comic readers. Since Dynamite began publishing Red Sonja in 2013 the comic has pulled in a huge amount of rockstar female writers and artists. Those who have worked on the comic include Writers Gail Simone, and Amy Chu. Both writers series have been well recieved by readers. The Red Sonja #1 was released with 6 variant covers featuring covers drawn by popular female artists including Fiona Staples, Amanda Conner, Colleen Doran, Nicola Scott, Stephanie Buscema, and Jenny Frison. To get these covers Simone reached out to the artists with the idea of having all female artist cover variants. Check out these cool Red Sonja products direct from Amazon to get ready for the film! Components that come with the game.